Lawn Maintenance Tips - How to Water Your Lawn. Water composition of healthy grass is between 70 and 85%. Water is essential to grass, just as it is to humans. It promotes the manufacture of food, seed germination, nutrient transport and absorption, cooling and the formation of tissue. Grass loses water when temperatures are high, humidity is low, when there is a brisk wind and with sun intensity. If grass doesn't have the proper amount of water, it cannot cool and is susceptible to browning, disease, wilting and death. The amount of water your lawn requires depends on the type of grass it consists of. Usually, one inch of water per week is sufficient, even in drought conditions. The amount of water your lawn receives can be easily measured by placing a shallow tin in your lawn and marking the side of it. If nature provides adequate rainfall, watering is not necessary. If you water your lawn too much, it will lead to fungal disease, excessive growth and very frequent mowing. It also wastes water and power resources and causes pesticides and fertilizers become ineffective. These can get into the sewer system and cause water treatment problems. If a lawn receives very little water during the intense heat of summer, it will retreat into a dormant stage and turn a very light green. It will recover easily when it is once again receiving the proper amount of water. However, if there is a severe drought, your lawn may die-out in spots and have to be top-seeded in the fall. You will be able to tell if your lawn needs watering by its color. Thirsty grass will turn a bluish color. If you walk on grass that needs watering, it will not spring back and you will be able to see your footprints because the grass is wilting. If you plan on installing or using a sprinkler to water, choose one that will keep the water close to the ground. Sprinklers that spray water high into the air are not recommended because water evaporates and spays onto the sidewalk and street. 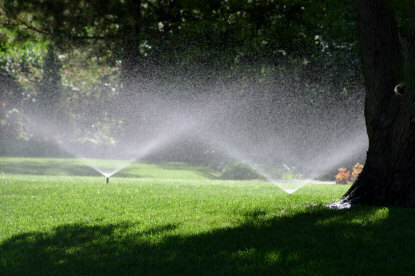 Be sure the sprinkler you choose will distribute water evenly and overlap to prevent dry spots in your lawn. Water your lawn between 6am and 9am to prevent evaporation. Night watering can cause fungal growth. Do not try to apply one inch of water at one time. Instead, water three to four times a week. Use the one-third rule when mowing your grass. This promotes water retention, increases the depth of the root system and helps grass to resist sun intensity. If you have a newly seeded or sodded lawn, it will need to be watered daily for at least one month. This promotes germination and/or rooting. Always mow with a sharp blade. Dull blades damage the grass. Aerate your lawn in the spring to loosen soil and allow water to reach the root system easily. Water deeply to promote a healthy root system and promote density. This decreases weed infiltration. Follow the tips in this article to keep your lawn in optimum health all season long.